Description: Images from a Structure fire that occurred on 04-27-2014. The Elderville Lakeport VFD recently acquired a Used Rescue Truck from the Longview Fire Department. Previously callsigned Rescue 2, this apparatus was purchased in 2000 from Martin Apparatus and manufactured by Pierce Manufacturing in Appleton, WI. This truck will be housed at our fire station 1 and will be callsigned Rescue 1. Elderville Lakeport VFD Units responded to a woods fire on Massey Rock Rd near SH 149. 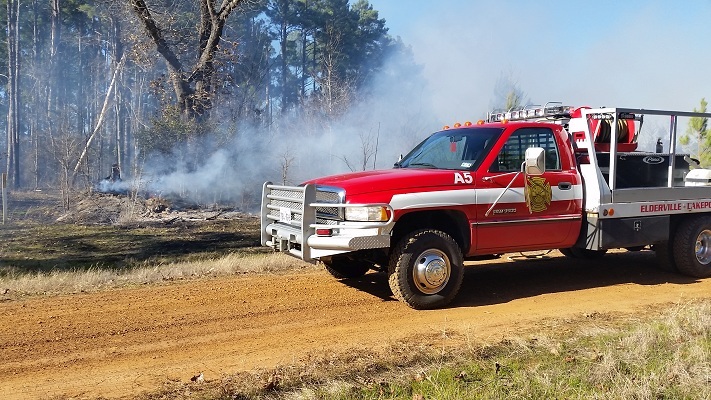 The fire was approximately 2.5 acres and was quickly contained by ELVFD personnel. Texas Forest Service was contacted as well as the Gregg County Fire Marshall who responded to the scene. With the beginning of 2016 coming about, here are our annual statistics from the year 2015.